I am using an HP laptop on Windows 10 x64. I have downloaded the latest beta of the Monero-core GUI from this link. Monero 0.10.1 is fully synchronized and running on my computer, and when I click on monero-wallet-gui.exe, an error message pops up. It says "LoadLibrary failed with error 1114: A dynamic link library (DLL) initialization routine failed." How can I fix this and properly run the GUI? This is an error with the Switchable Dynamic Graphics power setting in Windows. 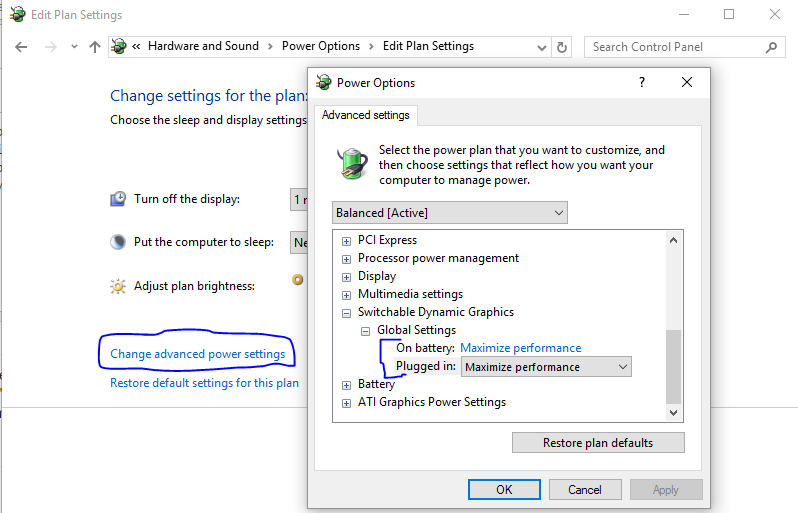 If you open Power Options, expand "Switchable Dynamic Graphics" and then "Global Settings", and then set "On battery" (if applicable) and "Plugged in" to "Maximize performance", it should run properly. Click apply and try running monero-wallet-gui.exe again. How to fix blank gui wallet splash screen?